・Before installing, the engine has to be stopped. ・No fire, No smoking when installation. 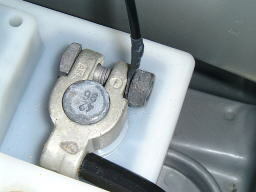 ・Nanopulser has two cables. Red cable is to the plus and black is to the minus. Car body is the "negative ground". 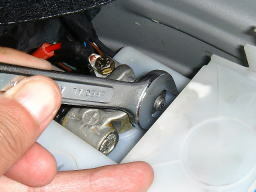 Do not touch between the spanner and body. Loosen minus nut of the terminal. terminal and fasten the nut. Loosen plus nut of the terminal. Check the two cables properly. 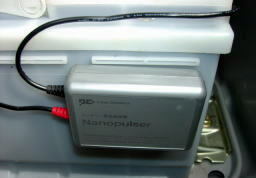 Set the Nanopulser by the tape. *Nanopulser has to be kept away from the engine, exhaust manifolds and fan belt. *Please set the Nanopulser on the flat surface. 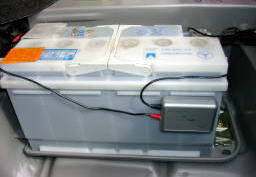 *Nanopulser can be set on the battery or the side body. 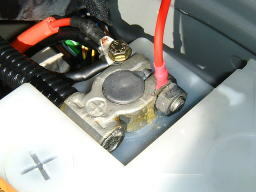 If the battery terminal is removed, the memory of the electric accessories will reset. 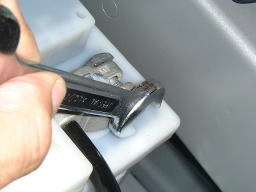 and remove it.（Pull it away） Loosen plus nut of the terminal.